Most people that know me know that we dont have kids and so our pets are like our kids...Kloe was our first and she was the runt of the litter,my 22nd birthday present from my mum and dad and she had a hernia so the breeders sold her off cheap.....she was one of a kind and the best dog ever...there was never a dull day with Kloe around.....I lost count of how many time she escaped and I walked the streets to find her and bring her home...I used to get so cross at her...not for her getting out but for making me to scared she would be lost or hit by a car.....but one look at that gorgeous face and a wag of her tail..which never stopped wagging ..and my heart melted and she was back in the good books. I'm so sorry to hear this, Krissy. It's always sad when our pets die, as they are family members. Beautiful photos Krissy, the perfect tribute to a beautiful, bouncy, lover of life. 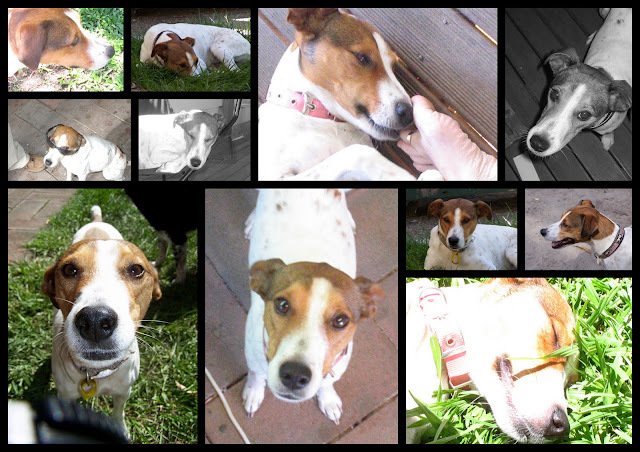 JRs are the best - RIP Kloe girl. awww sorry to hear Krissy :(. Oh no :( I'm so sorry for your loss. I know how much your heart must be breaking. I lost my beautiful fur baby Lucy almost 5 years ago, and I still miss her every day. Kloe looked like such a sweetheart, and I'm sure she knew how much you loved her. oh krissy i am so sorry for your loss. I remember losing my "baby" as well i also got as a birthday pressie from my family when i was young. i am sure shes an angel in heaven and is at peace now and looking down over you watching everything you do.